The 2013 Subaru BRZ has just received its fourth award in the last month as the Japanese automaker has announced the new rear-drive sporty coupe has received an honor this time for its engine. Ward's AutoWorld, a monthly worldwide automotive industry magazine, has named Subaru's BRZ "FA20" 2.0-liter 4-cylinder horizontally-opposed Boxer engine a winner of its 2013 Ward's "10 Best Engines" award. This makes the third win for Subaru engines of Ward's prestigious "10 Best Engines" accolade for Subaru. The first award came in 2004, and the second being the 2010 award both with the Subaru "EJ25" 2.5-liter turbocharged Boxer engine. The new engine not only powers the sporty two-door BRZ, but also the jointly developed 2013 Scion FR-S/Toyota GT 86. Toyota needed Subaru’s boxer engine because of its unique design. The BRZ Boxer "FA20" engine, is compact, lightweight and features a low-center-of-gravity that is ideal in a front-drive sports car. The engine sits ultra-low in the front chassis and delivers excellent handling performance because of the weight distribution.The boxer engine design gives the car a dynamically favorable front-to-rear weight ratio of 53:47 and a low center of gravity comparable to some exotic supercars. The lightweight design of the engine keeps the overall curb weight at just 2,800 pounds. The 2.0-liter engine recognized by Ward's AutoWorld was specially developed for the 2013 Subaru BRZ and the Scion FR-S/Toyota GT 86. The "FA20" is high-revving and features a completely square bore and stroke of 86 x 86 mm offering high-performance all the way up to the rpm limit. Toyota contributed to the engine by using their cutting-edge 4-DS direct and port injection technology that was added to the Subaru 2.0-liter naturally aspirated engine. The technology comes directly from the high-performance Lexus IS F.
The combined engine technology provides excellent fuel-efficiency as well as superior output of 100 ps per liter achieved with a naturally aspired engine. The winners were chosen by ten WardsAuto editors from among 40 new or significantly upgraded engines based on power, technology, observed fuel economy, relative competitiveness and noise, vibration harshness characteristics. To be eligible, each engine must be available in a regular-production U.S.-specification model on sale no later than first quarter 2013, in a vehicle with a base price below $55,000. 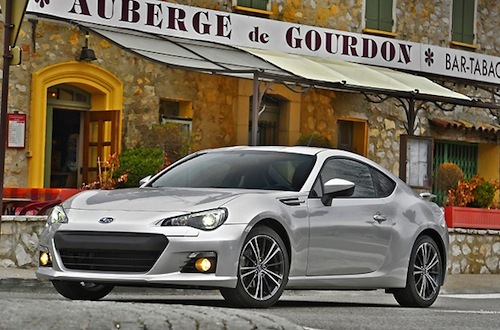 The 2013 Subaru BRZ has also recently been recognized for three other awards in the last thirty days. The two-door sports coupe has been awarded with the 2013 Car of the Year Special Award in Japan, the 10 Best Car and Driver Award and the IIHS 2012 Top Safety Pick. The judges composed of WardsAuto editors also recognized that the 2013 Subaru BRZ and Scion FR-S both come well equipped for about $25,000. Subaru has certainly come up with a winner with the new 2013 BRZ.